It’s Christmas again. What do you get her? This is the question that men all over Britain ask themselves. When you purchase gifts for a woman in your life all year long, for her birthday, for an anniversary, etc., then by the time Christmas rolls around, there isn’t much left you can think of to buy. Chocolates are always acceptable, but they are hardly personal. They don’t show much imagination or time invested into the occasion. But how do you find that kind of gift? We’ve got a suggestion. Does your wife, girlfriend or mother like roses? Most do. Does she like jewellery? Almost every woman would say yes to that. So get her an Eternity Rose, a beautiful combination of a rose and jewellery. 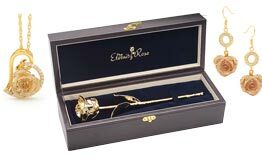 This rose is a real flower, preserved for a lifetime, coated in gold, silver or platinum. Or if she prefers the classic red rose, or has any other favourite colour, there are many beautiful shades of roses to choose from, that are glazed and trimmed in gold. Unlike flowers that last just a few days, an Eternity Rose lasts for a lifetime. 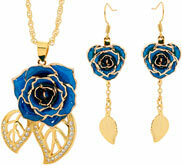 You can buy from The Eternity Rose with absolute confidence. If for any reason you are unhappy with your purchase, you have up to 90 days from the date of the invoice to return it and receive a complete refund, with no questions asked. We stand behind each of our pieces. For ladies, it can be even harder to buy for the male in your life. Plus you don’t want to give him another tie, do you? Does he really need more aftershave or socks? 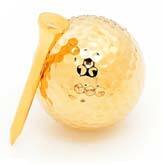 Instead, be different this year and give him a gold-plated golf ball and tee set, made by the same team at The Eternity Rose. You can purchase either a set that can be used on the golf course, or one that is simply for display in a special place at home. Not a golfer? Does he like to play cards? Then give him gold-plated poker playing cards. They are real conversation starters, made for playing. They are durable and sturdy. 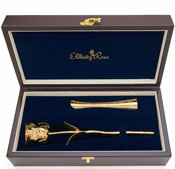 These gifts for him at The Eternity Rose also make wonderful presents for Father’s Day. There are no cheap novelty gifts made by The Eternity Rose; quite the contrary. We take pride in the fine workmanship and materials of the highest standard that are used on each and every one of our products. Merry Christmas to you and yours. 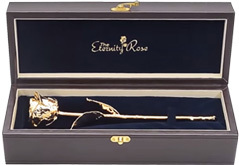 We at The Eternity Rose hope you enjoy our beautiful and unique gifts.